The Pearl at Watkins Centre specializes in managing the myriad of emotions that are a byproduct of Alzheimer’s and the many forms of dementia. 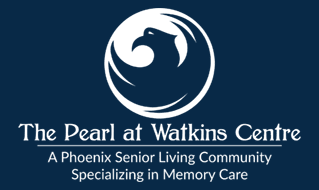 We also understand the impact that memory loss can have on family members and caregivers, and are here to support you by caring for your loved one at The Pearl at Watkins Centre. Our Memory Care Neighborhood is designed to emulate a homelike setting. Pertinent memorabilia and comfortable furnishings are carefully appointed to invoke a familiar environment. Our dedicated staff compliment residents’ individual skills and monitors their progress daily. We build cognitive wellness with activities like Active Reminiscing, and make special accommodations throughout the day to adjust to your loved one’s mood and mindset. We believe that transitioning into our welcoming community isn’t about reclaiming your old life, rather defining your new life.